In terms of space exploration Mars is a very busy place at the moment and likely to get even busier. At present there are three spacecraft orbiting the planet: the European Space Agency's Mars Express, and NASA's Mars Global Surveyor and Mars Odyssey. In March 2006 they will be joined by another NASA probe, Mars Reconnaissance Orbiter and there are plenty more in the pipeline. There is only so much that scientists can learn, though, from remote observations and that is why a number of landers have been sent, including the ill-fated British Beagle2 mission. As you are reading this two small-car-sized NASA rovers called "Spirit" and "Opportunity" are making their way across the Martian surface. We were very fortunate to have Doug Ellison lead us along the epic journey of one of the robot geologists known as "Spirit" with his talk entitled "Bonneville and Beyond: 617 Sols with the Spirit Rover". "Spirit" began its journey on June 10th 2003 aboard a Delta 2 rocket and landed on Mars in early January the following year. Its 90-day mission was to seek out any signs that showed the presence of water on the planet's surface. Hence, it was sent to a large impact crater, roughly the size of Wales, called "Gusev" where scientists thought that there may have been a large lake at one time. Its traverse of the surface began with a 3 metre drive to "Adirondack", a rock named after a mountain range in New York state, USA. Spirit does not have a geological hammer to examine the rocks but one of tools on its robot arm is a grinder tool called the "RAT". By removing the top weathered layers of the rock Spirit could examine it properly. The rock was found to be made up of volcanic basalt - just like the rock that comes out of volcanoes back on Earth. Well, 600-plus Sols later (one Sol is a Martian day) it's still going strong. Unfortunately, volcanic layers cover the crater floor hiding any past evidence of water radically altering the rocks and soil. But as it has climbed "Husband Hill", 106m higher than the landing site, it has come across rocks with much 'wetter' histories and outcrops of rock that appear to be made of layers. Not all of its journey has been plain sailing though. Early on in the mission its memory became so full of stored files that it nearly stopped working altogether. Then one of its wheels began to stick and it ended up having to drive backwards on 5 wheels instead of 6. This only improved when rough ground jolted the stiff wheel back into service. But the Martian environment does have its good side. The fine red dust that was beginning to coat Spirit's solar panels and deprive it of power was whisked away overnight. The NASA engineers think that a strong dust storm or even mini tornados known as 'dust devils' gave the rover a dust bath. So, with luck, and the expertise of the engineers at NASA, you can be certain that Spirit has many more 'Sols' left in it yet. 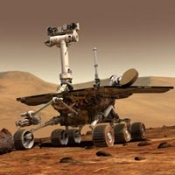 To follow Spirit and its twin rover, "Opportunity" you can go to their mission pages at http://marsrovers.jpl.nasa.gov.